There is a feeling of reassurance when one has a bird in the oven, the table set with thoughtful trimmings and family round to celebrate life, and these weekly celebrations come in the form of a Sunday supper. Sunday, in my family, is a day of repose and relaxation. A day where nothing particularly important happens, but, oh, how we luxuriate in it. One frill that must be exalted is the butter-anointed chicken that slowly renders all of its lovely juices to my roasting pan and crisps up in the oven so its skin becomes stunningly bronze. Best of all, in going with the languid theme of the day, all I have to do to the bird is bathe it in butter and stash it away in the oven. Within no time, aromatics fill the house and family feel comforted as you greet them at the threshold. Roasting leaves time for the cook to patter around the kitchen, making sides or a dessert for the supper, or in my case, squeezing in a nap. Finally, the time will come for the family to gather at the table, which is the hearth of the home. Conversation will linger and candles will slowly begin to burn. The moment the dinner arrives at the table, silence will quickly overcome all but the slow flicker of a tiny flame, as we give thanks for those around us, the meal that we are about to receive, and, then, we feast. And always, on Sundays, we shall feast with family, as it should be forever and ever, amen. Note: For every 1-pound of chicken, cook for 20 minutes, so make sure you pay attention to the poundage of the bird before you start a timer. Depending on the size of your chicken, you may need to adjust the cooking time. Combine butter, red pepper flakes, salt and pepper in a bowl. Tie the two legs of the chicken together with twine, or, flip the bird over and cut out the backbone (and stash it in the freezer for later use in homemade chicken stock.) I prefer to cut the backbone out of the bird and break the breastbone. I like the chicken to lay flat while roasting, ensuring the bird is cooking evenly, but if you prefer to cook the whole bird as is, just tie those legs together, darling! Boldly and confidently dig into the butter mixture and tuck it underneath the skin of the bird. Gently massage the butter all over the outside of the chicken. Let the chicken rest for 1 hour at room temperature. After 1 hour of resting, Place the chicken into a roasting pan and allow the chicken to roast for 1 hour, basting with the drippings halfway through the cooking process. If you notice that the skin is getting too brown, tent with foil. Let the chicken rest for at least 15 minutes after it roasts to allow the juices to redistribute within the meat. Serve with cauliflower mash. Place all of the ingredients onto a roasting tray and roast the vegetables in the oven for 45 minutes (or until the vegetables begin to caramelize.) Place the roasted vegetables in a large bowl and add remaining 2 tablespoons of olive oil and parsley. With a potato masher, mash all of the ingredients until desired consistency. Season to taste. This is the best chicken I’ve ever had! And that cauliflower mash…forget it. Oh thanks! Such a compliment from a poultry hater! This looks excellent – there’s nothing better for Sunday dinner than a roast chicken. Beautiful photos, too. Oh that sounds so lovely! I bet it was amazing! Butter makes everything better! It makes this chicken crispy and juicy at the same time! Yum! I tried it with my little girl. We both loved it! We added more of the Pepper flakes for a stronger bite on the 2nd time we made the Recipe. Both times we have to say Thank You for this Delicious Treat! 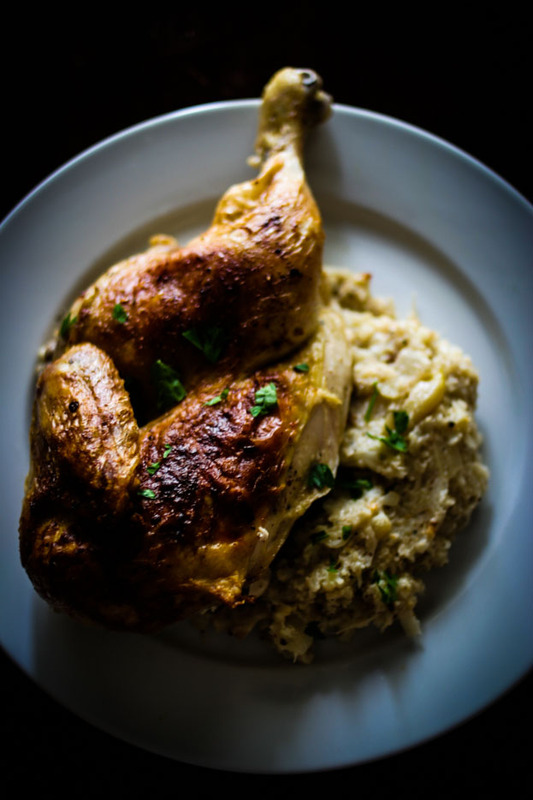 We are storing this on our “Love Section” of Chicken Recipes! 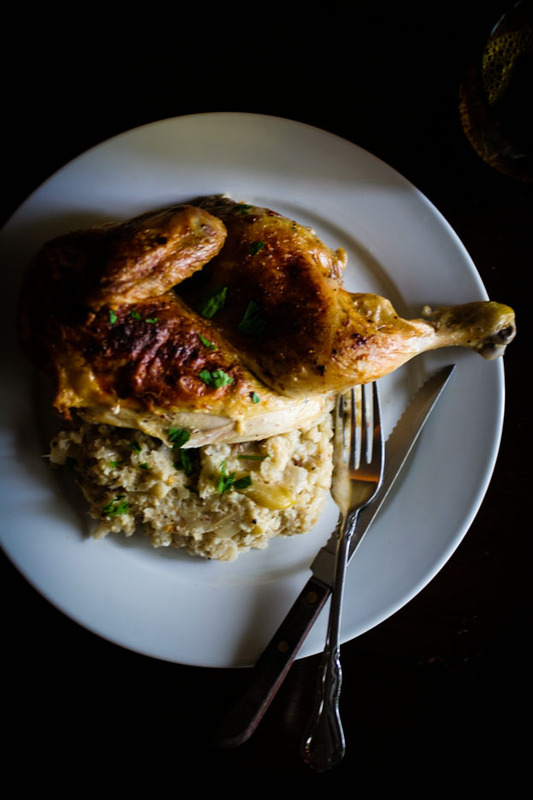 I feel honored to be able to share a beloved chicken recipe that has graced your table! Thank you for sharing this precious memory of making this dish with your little girl! I love that.